Let me start with how I came across this book. I had never ever heard of this book until Shailaja shared it on her Instagram story that this book was available on the Kindle for under 100 bucks for a day. Since I trust her choices, I promptly bought it. Later, she tells me that she's not read it, but has heard good things about it. Then Shalini recommended the book on her blog and I knew that I had made the right choice. Soon after, I began reading it. It took me quite a few days to get used to the title of the book. It is almost like a tongue-twister and only half-way through the book I got to say it correctly. This book is a historical novel set in 1946. The best part about this book is that the entire book is in the form of letters written from one character to another. Yes, every word that is a part of this story comes in the form of a letter. Even the characters are introduced in letters. 32 year old Juliet Ashton is a writer and is on a cross-country tour across England to promote her latest book. When Juliet receives a letter from Dawsey Adams, a complete stranger from Guernsey, an island in the English Channel off the coast of Normandy, who has come into possession of her copy of 'Essays of Elia' and wants to know more about the author, Charles Lamb. 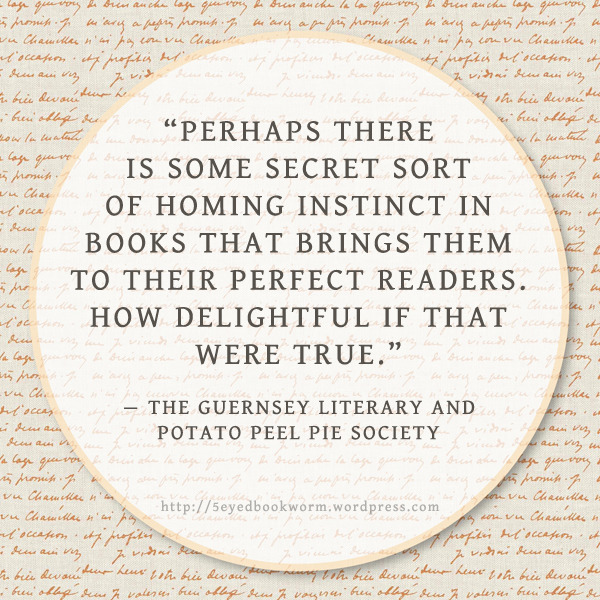 He also writes about a book club that he is a part of called 'The Guernsey Literary And Potato Peel Pie Society'. Intrigued, Juliet offers to send him more books by Charles Lamb and inquires more about this society. Dawsey has a few other members of the society write to Juliet and soon the correspondence becomes regular. After learning that the society began as a cover for residents breaking curfew during the German occupation of Guernsey, Juliet decides to incorporate it into an article that she's writing. Juliet also learns that a young woman, Elizabeth McKenna, the beloved founder of the Society, was arrested and sent to a prison in France by the Germans and has yet to return home. The members of the Society are raising her child, Kit, among themselves until Elizabeth returns. When a mysterious Markham V. Reynolds starts sending her flowers stating that he's a fan, Juliet is warned by Sidney, her friend and publisher that Reynolds belongs to a wealthy family that is trying to open a publishing business and wants to poach her. Still, Juliet finds him interesting when she meets him and they soon begin dating. 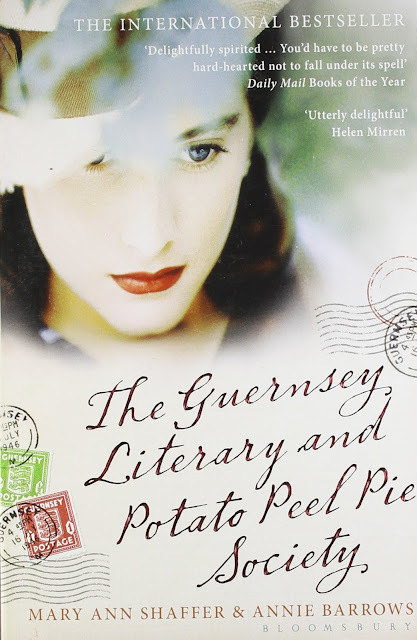 As she continues to write to the members of the society and they to her, Juliet begins to plan a trip to Guernsey to do research for a book about the group and their experiences of the war. In Guernsey, Juliet is treated like an old friend and soon helps to watch Kit. She becomes friendly with all the people around and doesn't feel like leaving Guernsey. But, she has to answer Reynolds who had proposed to her before she left for Guernsey. Also, Juliet begins to have feelings for Dawsey. What would she do now? Will she have to leave Guernsey, the place that she has come to love now? And what about Elizabeth, will she return? After submitting the first draft of this novel to her publishers, Mary Ann Shaffer fell ill. When the publishers came back to her with some changes, that would require considerable re-writing, she was not in a position to write it. She asked the daughter of her sister Cynthia, Annie Barrows, an established author of children's literature, to finish the editing and rewriting. Barrows did so, and is credited as co-author of the novel. Mary Ann died soon after. The book has such a brilliant story and its execution is top-notch. This is not the first book that I've read that is narrated in the form of letters, but this one is clearly the best. The descriptions of London and that of Guernsey is so picturesque that you feel the scene unfolding in front of your eyes. After 'The Book Thief', I fell in love with the genre of war, and this one added to it. The condition of the people in Guernsey during the German occupation brings tears to the eye. It brings even a chuckle, when details of how they smuggled their food and books is mentioned. The one particular story about a pig roast is so well conceived. The back story of how the society got its name too is very interesting. Some characters are so adorable. Apart from Juliet and Sidney, Iola and Dawsey do stand out. Honestly, I predicted the ending, but there is no other way I would have wanted the book to end. Apparently, there is a British movie too based on the book. I'll be watching that soon, but I know for sure that it would not do complete justice to the book. Verdict: This is a book about book lovers corresponding in letters about books. What's not to like? 3 people recommending this book plus the fact that its a war genre, is good enough reason to make me read this!!!! You'll love it, I'm sure. It was one of my favorite reads from last year. I am glad you liked it too :). Hahaha, the title is hard to digest. But once you realize the story behind it, you'll know how beautiful it is. Do read this. Thank you for coming back to comment again, Rachna. I wonder why I didn't get your first one. This book is very different yes, but that's the beauty of it. The story of the war beautifully unfolds through these letters. It is definitely worth a read. Is it difficult reading? Is the language easy to follow ? I keep putting it off because I got that impression about this book somehow . That's what I was worried about too, but once I started it it was so simple. The language is very British and I learnt so many new words. The story, the words, the book love, it is all worth it. Trust me. Thank you Soumya . I generally love the books you recommend. Adding this to my to-read list. You are welcome, Smitha. Do let me know how you liked it. Worth every single star you gave it. It was such a feel-good book it left me in a happy haze for a long time.